There’s fewer things prettier than the deep ocean blue colors that mottle together. In truth, any blue is gorgeous. I love the color blue, in fact, it’s one of my favorites. Coming up with variations of blues to use in my designs is always a fun adventure. I stumbled upon this clay color recipe completely on accident, but have used it several times already. Enjoy! To the right is the chart of what happens with each main combination and how the color changes. Add 1/2 part Premo! silver for a nice added shimmer. Add 1/4 part Premo! Black for a deeper blue, reminiscent of navy. 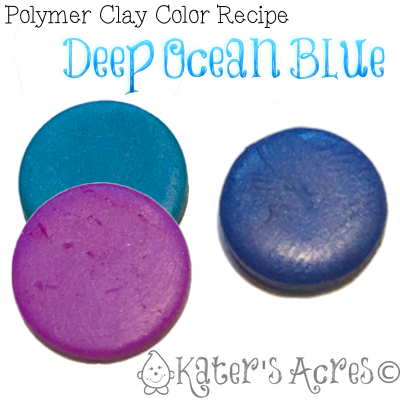 What kinds of things would you make with today’s clay color recipe? Feel free to post your creations on my Facebook page and show everyone what you have made with the color palette from today’s blog post. Also, feel free to tweet your picture to @katersacres with #KatersCP to show off your creation! I hope today’s color selections help you get back into your studio this weekend! Thanks for joining me today and don’t forget to sign up for more tutorials, prompts, and projects direct to your email. Sign up now. Yes. You can use acrylic paints on both raw & cured clay. You can also use oil paints on cured clay.